Golden Fried Carrots, quick and easy vegetable recipes. The first time I made Beef Provencal the recipe instructed to fry the carrots before adding to the stew. They were so good, I started frying them just a bit longer and eating them on their own. 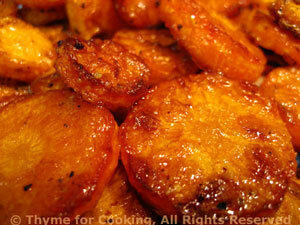 It caramelizes the sugars and turns them golden and sweet! Add carrot slices in one layer. Let fry undisturbed for 8 - 10 minutes. Check one after 7 minutes to make certain they're not getting too brown. Using tongs, turn them over and fry the other side. They should be getting a few light brown spots on them where the sugar (from the carrots) is caramelizing. Fry another 7 minutes then check again. The second side will brown faster than the first.